In response to allegations brought forward by Executive Assistant Samuel Montoyo and various members of Grupo Progreso (GP), including two candidates for Sangguniang Panlungsod (SP), Bacolod City Councilor Wilson Gamboa, Jr. called a press conference yesterday to discuss the alleged P1.5 million in unliquidated financial assistance for the Philippine Councilors League-Bacolod (PCL-Bacolod) in 2015, when he served as presiding officer. He explained the P1.5 million was submitted in a 2015 liquidation report, which was submitted to the city’s accounting department, under Corazon Cardel. The report was then forwarded to the Commission on Audit (COA) for a pre-audit. Gamboa acknowledged, in June 2016, a “Notice of Suspension” was issued by COA auditor Leilani Bojos on the grounds of “lacking documentary requirement(s).” The local PCL chapter responded by submitting the requested documentation the following month. By August 2016, Gamboa turned over leadership to City Councilor Em Ang, along with presenting the liquidation report before the SP in the presence of then-Department of the Interior and Local Government-Bacolod head, Engr. Carmelo Orbista; along with several national PCL representatives. That November, Cardel cleared and closed the local PCL chapter’s books of account and issued a journal voucher, which zeroed the account. Gamboa also noted, there were delays with the COA due to a reshuffling of staff, including the appointment of a new state auditor, Perico Hernaez. 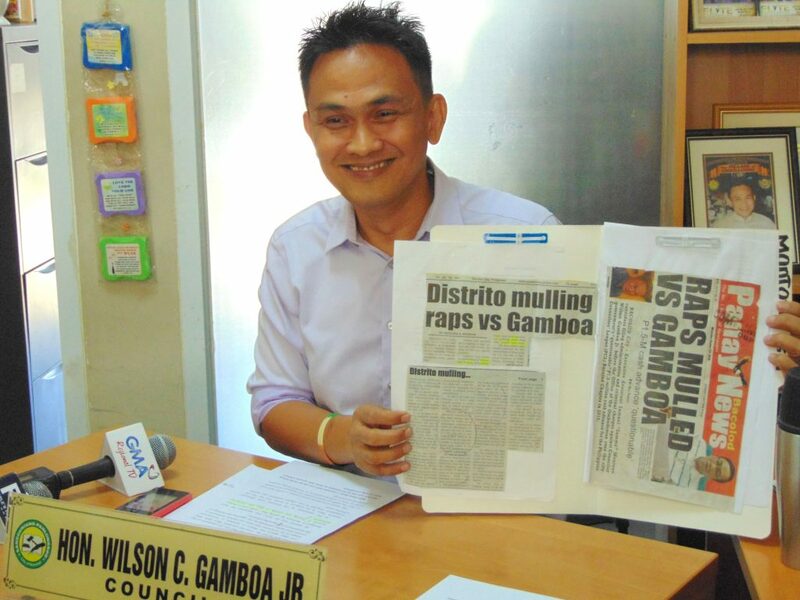 Aside from Montoyo, Gamboa also called Marlon Solidum and Al Espino, both GP candidates for SP in the upcoming midterm elections, along with individuals he identified as “Salas” and “Baliguat,” as “maligners and slanderers.” The city councilor called the complaint filed against him “pure political harassment” as it came about after he questioned the P8 million in expenses for the city government’s Employees General Assessment-Christmas Party.